Claire’s book – What’s it all about? What’s in the book and who is it aimed at? This book is for anyone studying maths or wanting to assist others studying maths. If you, your family or friends are sitting GCSEs shortly and you want to be able to assist using fun, memorable methods, this book is ideal. Parents buy the book so they can help their child without having to hire a private maths tutor or buy study texts that get left on the shelf. This book also appeals to teachers who want to try wacky methods in their class. 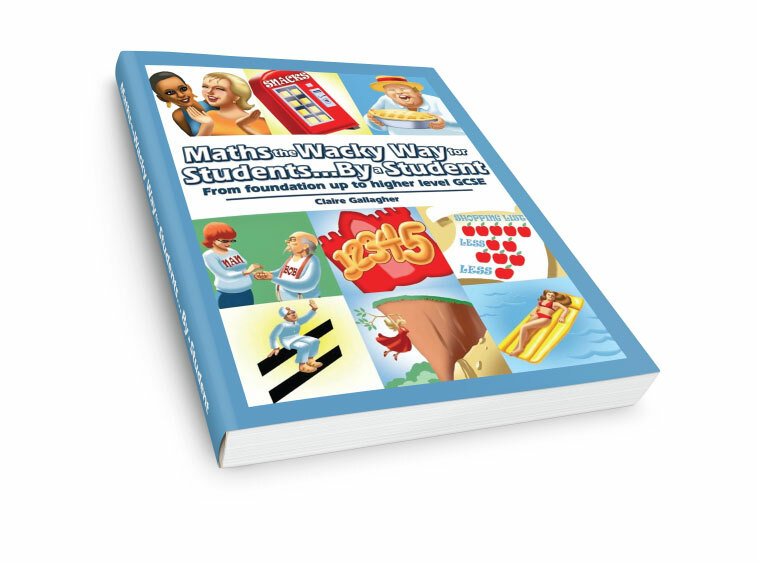 It doesn’t matter which category you fall into, Maths the Wacky Way is the ultimate study guide to getting your head around all areas on the maths syllabus: algebra, trigonometry, equations, vectors, histograms, etc. The book has colour on every page with the exception of six pages, shows fully worked examples, there are practice questions at the end of each section and clear worked answers at the back of the book. The great thing with this book is that it explains all areas of maths in a modern and ‘wacky’ way – honestly maths can be fun! Let Claire help you build on what you already know and help you crack those mental blocks to get that grade average up a notch or two. Please click here to download your free, full colour preview of Claire’s book now. There’s nothing to sign up to, just click the link and it will download the excerpt automatically and open as a PDF document. If you don’t have a PDF reader, click on the Adobe link below for a free copy of Adobe Reader. Kai was delighted to have it direct from you, he's into autographs at the moment and was gobsmacked to have a real author send him a book! My niece was really struggling with parts of her maths revision and I was embarrassed when I couldn't help her out. I always loved maths but a belligerent teacher made lessons a misery and I never did well. However, with one reading of 'simultaneous equations' I was for the first time in 50 years able to understand the whole procedure. This book is a revelation and I will be reading it myself from cover to cover to catch up on what I missed out. Thank you Claire. She uses modern things like comparing algebra to a computer game. This helps me remember key points about the topic. With Claire's methods of teaching our daughter achieved Grade B instead of the Grade D she was predicted. The way Claire explains how to do things is very simple but is very effective. Things I have learnt in the past from my teachers would never stick but Claire's methods haven't been forgotten yet! Using things you recognise such as computer games and flying symbols makes things so much easier to remember compared to the normal method.